Derk's Uniform embodies a story of over Seventy-five years of passion for the textile and apparel industry. Originally formed in 1939 by the hands of Stephen Derk a trained craftsman's in the art of tailoring and patriarch to the Derks family. Stephen was forced to make garments for German officers during WWII. Upon managing to flee from their grasps he sought refuge in Italy for over a year. Stephen eventually worked his way to Edmonton, Canada to start a new life and continued to work in his trade for over 30 years. With a love for fine tailored goods and a philosophy of hard work and elegance, he embodied these virtues to heart as we do now. In honor of this man, we stand by the same values and traditions that he has pasted down to our company from generation to generation . Darrell continued to work with Derks Formals and Menswear. That made for a very busy young man. Darrell received a degree in Business Administration from Okanagan College. He managed Shop International for Woodwards in Edmonton for two years. Darrell's exceptional eye and love of photography led him to freelance as a photographer from the time he was 21. In 1981 he opened his own photography studio, which he kept alive until 1995. Darrell purchased Derks Formals and Menswear from his father in 1989 and his vision has taken the company to new heights. He has expanded the operation to a total of three locations- two in Edmonton and one in Calgary. Darrell has also broadened the vision of what Derks, the organization, is and does. Derks has expanded its initial exclusive focus on clothing,to include going back to the roots and help make tailored uniforms for people all across this nation. 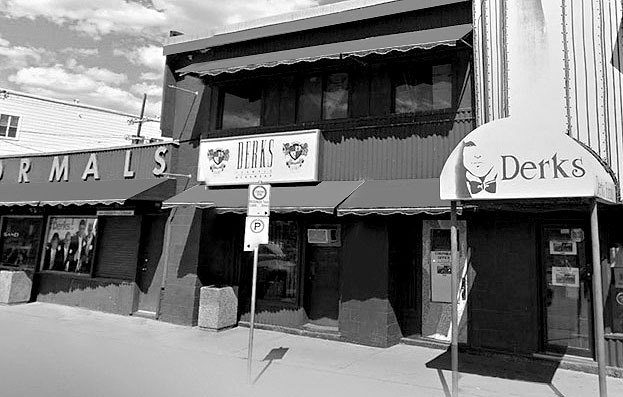 In its three storefront locations, Derks continues to build a reputation of dressing ladies and gentlemen for their special occasions in life . Away from the office, Darrell is known to be no just a music lover but an experienced audiophile. He still enjoys photography and his work can been seen in a variety of Derks publication and collateral materials. Darrell studies and collects art and also enjoys travelling with his family. Landon's history in the company started much the same as his father (Darrell) starting to work for the family business in his teens. His father believed in instilling the work ethic that the family has always had and learning the business from the bottom up. In his early years he started work in the warehouse and cleaned shoes for the summers and helped with the sidewalk sales at a local event on Whyte Ave. Over the years Landon learned how to run the business from hands on experience. Landon now focuses his time on improving the overall customer and staff experience at Derks Fine Group Of Companies. This includes working directly with clients and staff to learn from them of what they want and what they need and to help bring products and services to the mix at Derks.